Bold and Confident, Artistic, Creative; Don't care about what others say! 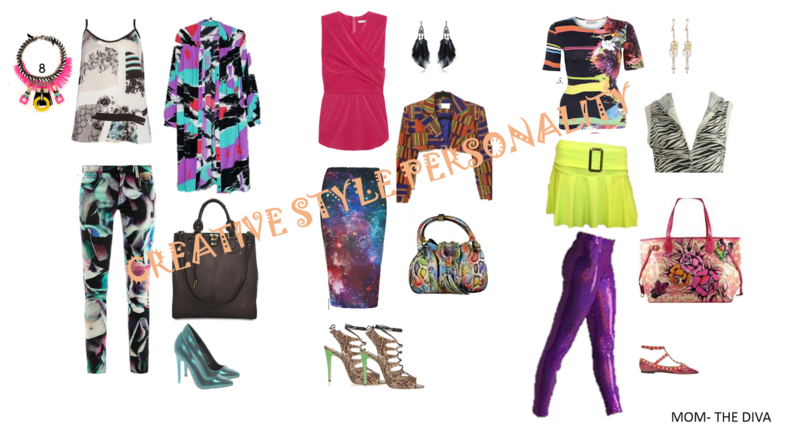 Play with colours, proportions, prints etc. Mix and match vintage with high street fashion, floral prints with checks, extreme colours etc.. Creating Clashes in your garments and carrying it off well. Bold Colours, Different styles of clothes, printed everything, quirky details, clothes from different decades, basically whatever catches your fancy! and a few pieces of basic tops, t-shirts, shirts, jeans and trousers as a base for your creation. Confidence is the key for you! You either look good with this style or you don't. Create this style only if you think you can carry it off. If you have a really small frame, avoid heavy layering, which could make you even smaller, if you can't then wear heels! Lady Gaga, Rihana, Kate Moss, Sarah Jessica Parker.